Moving house and now a spring clean caused me to stumble across some more data from my Tenerife trip last July 18. 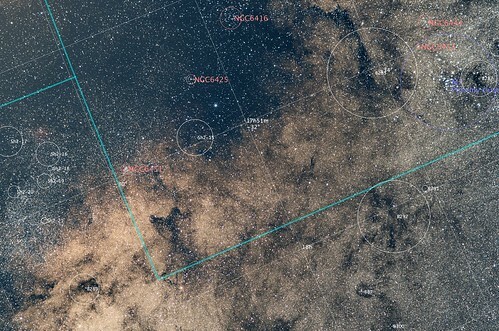 This is a section of the Milky Way focusing in on M7 the open cluster seen here in the upper right corner. Missing on this annotation as PixInsight does not include the catalogue are the Lynds Dark Nebula and the most prominent here is LDN1795 which is the large irregular dark nebula below and slightly right of NGC 6451 a small open cluster. Clearly there are also many Barnard dark nebula and one cannot miss the fact that the image is filled with stars, millions and millions of stars!